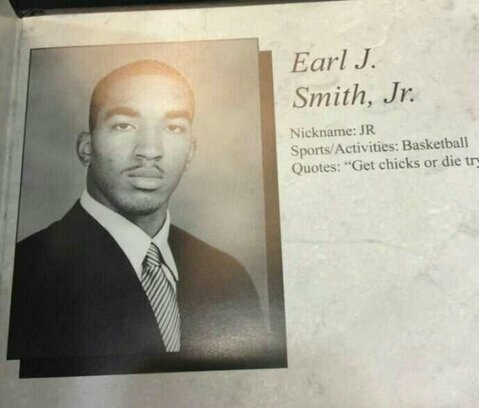 Trading away team headcases is a time-honored NBA tradition. From Dennis Rodman’s Detroit exit in 1993 (and then from San Antonio to Chicago in 1995) to Ron Artest’s unceremonious trade out of Indiana in 2005, getting rid of serviceable but troublesome players allows both teams and players to move on from the skeletons of a marriage gone awry. In situations like these, a player’s future success (Rodman’s with the later three-peat Bulls, Artest’s with the Lakers) tends not to cast the trade in a bad light because the team had decided it simply could not function the same way anymore. On Monday, two teams expurgated veritable Anthony Fremonts, as the Cleveland Cavaliers dealt Dion Waiters to the Oklahoma City Thunder while acquiring J.R. Smith from the New York Knicks as part of a three-team trade which also involved Iman Shumpert. Both Smith and Waiters had endured franchise-altering waves in the last few months, and now each is set to test exactly how much a change of scenery can do to help a player’s psyche, to the betterment or detriment of their new teams. Through his first two full seasons in the NBA, Dion Waiters performed respectably for a frustratingly mediocre Cleveland Cavaliers team which featured another, considerably brighter young star in point guard Kyrie Irving. In that time, Waiters averaged 15.3 points and three assists while shooting 34% from three-point territory, though that number went from a pretty horrid 31% in his first year to 36% in his sophomore campaign. As would happen to any player’s offense when two perennial All-Stars become teammates, Waiters’ production has suffered this year alongside Kevin Love and LeBron James. Waiters is averaging 10.5 points and 2.2 assists, but he is also taking about three fewer shots per game. The most alarming aspect of his campaign is that he seems to have lost all confidence from beyond the arc, dropping almost ten full percentage points from last year to 25.6%. What people will inevitably chalk this trade up to, however, is his tumultuous relationship with Kyrie Irving and the powers-that-be in Cleveland. Even as the two themselves spoke of there being no issues, there always seemed to be rumors coming from behind closed doors that the backcourt could not coexist. The Cavs had to pick one or the other, and Irving is the obvious choice for their long-term, even if Kevin Love skips town after this season. So Waiters ends up alongside Kevin Durant and, naturally, noted basketball cocaine proxy Russell HUSTLE BUSTLE Westbrook in Oklahoma City. The Thunder are miles ahead of where the Cavs were in terms of chemistry, and Durant is the best player in the league without a championship ring. Hopefully, what this trade does is put a slighted player, Waiters, on a team, the Thunder, that will never get the respect it so desperately desires until it wins. Two negatives creating a positive, or something like that. Injuries to Durant and Westbrook at the beginning of this season forced Brooks to develop a more nuanced coaching style with a limited ensemble, and now that the marquee stars are back, the addition of Waiters seems more like a push than a desperation move, contract implications surrounding Reggie Jackson notwithstanding. 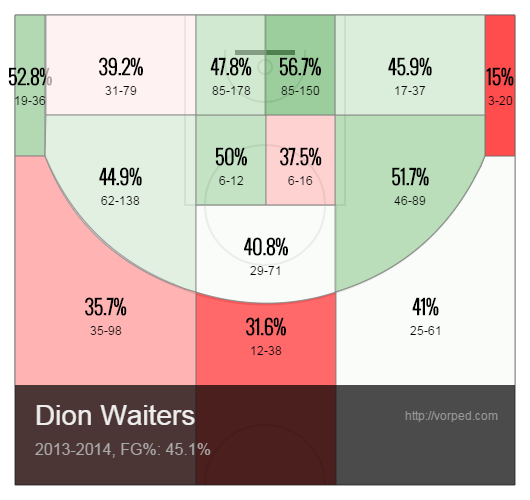 In particular, Russell Westbrook should ignite the best of Dion Waiters. That last statement is predicated on the possibly ill-fated assumption that their personalities coalesce in the backcourt, but their playing styles are dissimilar enough physically that it’s a crazy thing which just might work. Anybody that watches the Thunder can tell you about Westbrook’s insane tenacity on offense, particularly when driving to the rim. He is among the best in the league at generating points around the basket, especially off pick-and-rolls, either by making a circus shot or drawing a foul. Sometimes both. 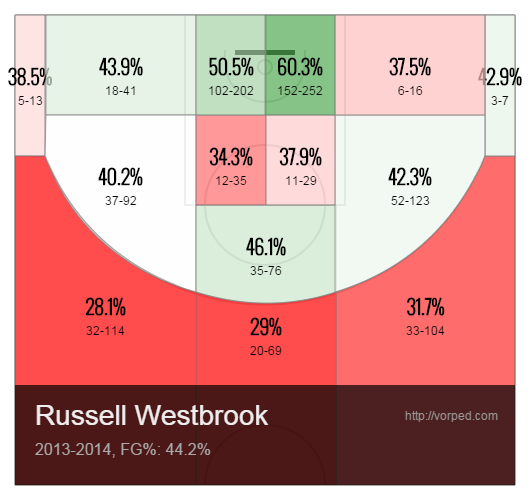 Westbrook’s playing style is more literally straightforward than you might think. Last season, over 56% of his shot attempts occurred in the lane or directly in front of it, facing the basket straight ahead, rather than on the wings. Waiters, on the other hand, has a more even shot attempt distribution, though certainly he had far fewer ball handling opportunities. Their shot charts from last year tell the story of what has the potential to be a much more snug fit than Westbrook currently shares with Jackson. It is pointless to insert Durant’s shot chart from a year ago; just know that he is so efficient that he deserves LEED certification. I’ll be the first to admit that this is an incredibly simplistic and rudimentary view of how these two could end up interacting with one another. Having said that, Waiters and Westbrook appear to be solving each other’s puzzles. Where one lacks, the other is clinical; where one struggles, the other thrives. From a purely basketball standpoint, as well as from an alliterative one, Waiters and Westbrook seem poised to stand in each other’s blank spaces. When Russ goes steaming into the lane without a plan B, especially when Durant is on the bench or facing a double-team, Dion can be his antidote. The Thunder badly need a third scoring option, one who can play on the wings the way that Waiters does. Let’s not kid ourselves: for all his offensive improvement over the last few years, Serge Ibaka is never going to fill the kind of space James Harden once did. That isn’t to say that Waiters can, because he definitely won’t, but he is at least as functional on offense as Reggie Jackson, and a better defender (albeit marginally) to boot. Again, this predicates itself on a few possibly radical assumptions, personalities and Waiters’ return to long-range functionality foremost among them, but if they become comfortable with one another the way that Westbrook and Durant have, the Thunder could approach a level of basketball potency it hasn’t approached since it dealt a Sixth Man of the Year to the Houston Rockets in order to let him grow his beard.